Found in 15 Western North Carolina counties, these wide-ranging flowers (found as far away as Asia) grow in the region’s moist, shady woodlands. Calceolus, the alternate Latin taxonomy, means “little shoe,” as the blooms resemble slippers. Other common names are moccasin flower, squirrel foot, or Venus’ shoe. These hardy perennials can live up to 40 years, and typically reach one to three feet in height. Long valued for its medicinal properties, this orchid was once used to treat pain, anxiety, nervous disorders, and heart problems. Native Americans used it to rid the intestines of worms. After serving as a protective covering for the developing bud, the spiral-shaped sepals twist away from the bloom. 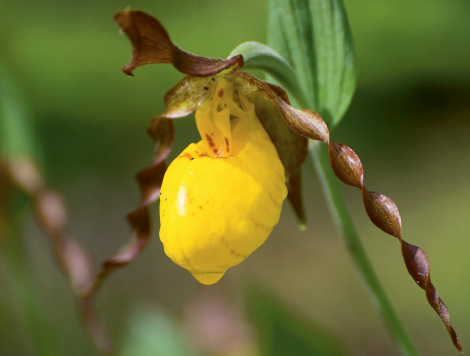 The Lady’s Slipper has been voraciously overcollected, and typically doesn’t thrive when transplanted. To protect the orchid, its locations in the wild are often kept secret.